Oregon State University Press, 9780870718816, 304pp. By an early age, Robert Michael Pyle discovered that he had a greater facility with words than with numbers. In high school, he found he could get good grades and win essay contests by relying on words alone. But he wasn’t really moved to write until a powerful experience in the summer of 1965 brought his pen together with his passion for the natural world, and he wrote his first heartfelt essay. That essay began a life path devoted to natural history, nature conservation, and language—and how they all meet in the literature of the land. Working in a succession of far-flung jobs in biological conservation, teaching, and field research, Pyle eventually gave up a regular paycheck in favor of a freelance existence devoted to his mutual passions for nature study and writing. All along, he wrote, and wrote. To date, he has written twenty books and hundreds of essays, stories, papers, and poems. But it is the occasional prose—the deeply personal essays that explored and indulged his immediate fascinations—that make up this selection of never-before-collected testimonies. Arranged by decade, Through a Green Lens presents a sampling of Pyle’s work over fifty years, from that first heartfelt essay, written on mountain motel stationery in 1965, to a book foreword written in 2015. Culled from notable magazines and contributions to edited collections, these essays range across broad topical, geographic, and textual territory. They grow out of near-lethal English brambles, vacant lots and ditches in suburban Denver, and railroad yards of the industrial Northeast. From commentary to criticism, polemic to profile—from the lyrical to the elegiac—Through a Green Lens demonstrates the qualities for which Pyle’s work is well-known: clarity, readability, sharp wit, undiluted conviction, and good-natured tolerance. Pyle’s half-century-long view, acute and uncommonly attuned to the physical world, gives readers a remarkable window on the natural setting of our life and times. ROBERT MICHAEL PYLE is a biologist, writer, and Guggenheim Fellow with a PhD in Ecology and Environmental Studies from Yale University. His twenty books include Wintergreen (John Burroughs Medal), The Thunder Tree, Sky Time in Gray’s River (National Outdoor Book Award), two poetry collections, and standard works on butterflies. He founded the Xerces Society for Invertebrate Conservation, and has been named an Honorary Fellow of the Royal Entomological Society. He lives in rural southwest Washington. 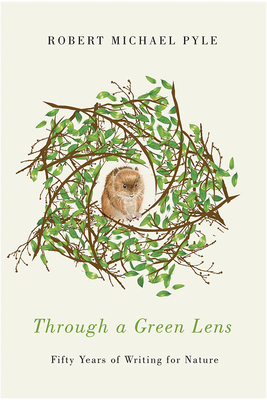 "Through a Green Lens is an unusually intelligent and beautiful read that captures the ever-evolving substance of nature as much as a creative mind in splendid bloom."